Top page > Corporate Information: Plants and Equipment > SAMTECH International Co., Ltd.
SAMTECH Co., Ltd. founded SAMTECH International Co., Ltd. in California, U.S.A., in 1996 with the purpose of developing and manufacturing liners (main units) for high-pressure gas cylinders. 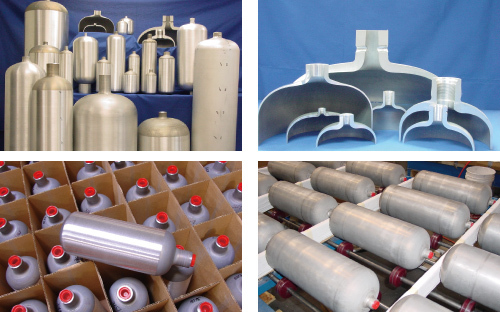 SAMTECH International has begun the development and manufacture of cylinders that can hold high-pressure gases, such as oxygen, natural gas, and hydrogen, which are expected to experience increased use in aerospace, automobile, and medical applications. SAMTECH International is using the plastic deformation method (called flow forming and developed by the Japan R&D center of SAMTECH) to manufacture these high-pressure gas cylinders. By forming the liners with spinning technology, SAMTECH International is able to make the liners extremely thin, answering the demand for lightweight products in this sector. Using its own forming methods, SAMTECH International has contributed greatly to raising the quality and reliability of our products. NASA uses our high-pressure gas cylinders in its artificial satellites and rockets, and SAMTECH expects to continue to expand its market in this field worldwide.